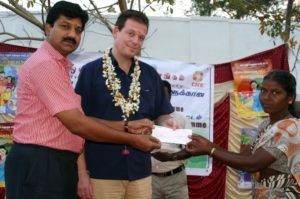 Mr. Michiel Berende, former underwriter and process manager for Dutch insurer Interpolis, got interested in microinsurance when he visited India in 2004. He witnessed the after effects of the The Tsunami of 2006 and saw how much insurance can make a difference to vulnerable sections of the population in situations like this. In 2006 Michiel became a member of the Microinsurance Network, formerly called CGAP Working Group on Microinsurance. From 2007 Michiel started as a freelance consultant with a focus on insurance and technology. As a consultant he worked for the Microinsurance Network, PharmAccess Foundation, ILO, GIZ, IADB, Achmea, and others. Conducted projects in Asia, Latin America and Africa. In this interview Michiel talks about how blockchain technology can revolutionise agriculture insurance in countries like India. I’m from the Netherlands and started my career as an underwriter and process manager for a Dutch insurer. I got involved in micro insurance at a very early stage in my career. Part of my first job, I had been to India in 2004. I was working for few years with a micro finance organization in Tamil Nadu. It was during my time in India that I realized how important insurance is for the financially- excluded people. By financially-excluded, I mean people in poverty who are struggling to with primary things like opening a bank account. I witnessed the 2006 tsunami, when in India and I saw firsthand how insurance can literally make a difference between a normal life and living in poverty. Unfortunately, only less than 10% of the population in emerging economies have access to financial services. My task in India was to help this microfinance organization look for the right insurance technology. This was when I realized that there was no proper technology available for this purpose. The large corporates have the technology. But small micro finance organizations do not have the technology to scale up and reach out to a large number of financially excluded people. This was an eye opener for me. When I came back to Netherlands, I decided it was time to start out on my own. Then in 2013, I learned about Bitcoin. I was intrigued by how it made possible to make small transactions valuable, instantaneously and inexpensively without the need of a third party. Only later did I learn that Bitcoin was just the tip of the iceberg and that the blockchain technology was the enabler. But the main thing that got me excited was the possibility of automating certain insurance processes. That’s when I decided to dedicate all my time to the development of blockchain solutions for inclusive finance. I am currently working as Inclusive Insurance Lead at Etherisc ( www.etherisc.com ) . This is a Germany-based technology company that works on solutions to enhance access to financial services through blockchain technology. Etherisc is building a platform for decentralized insurance applications. The platform aims to allow corporates, not-for-profit groups and insurtech startups to provide better products and services. We believe this technology can help make the purchase and sale of insurance at lower operational costs, more efficiently, providing greater transparency, and democratizing access to reinsurance investments. How does blockchain technology help create better insurance products? In particular, blockchain allows automatic transfer of digital assets from one entity to another without an intermediary — a function often referred to as a “smart contract” — which can reduce operating expenses and improve transparency. Smart contracts are ideal for insurance. They can remove the need to trust one central authority, align the interests of pools of individuals globally, offer automated systems, bring vast improvements in efficiency, and facilitate risk-sharing. Given current frustrations with claims processes, they also offer significant potential by removing the need to submit paperwork. Pay-outs can be automated when the conditions embedded in the smart contract are met. This can be of great value for parametric insurance, where claims payouts are triggered when certain parameters are met, without the need for manual assessments or decision-making. Now, imagine what this could mean for inclusive insurance, specifically for index crop insurance. Index insurance products use data sources and algorithms for underwriting and pay-out decisions, making them an ideal candidate to demonstrate benefits of decentralized insurance. When certain conditions are met — be it a flight delay or an extreme weather event — a self-executing piece of code kicks in and claims are triggered. Today, customized policies for remote farmers to protect themselves against crop loss would likely be unavailable or prohibitively expensive. The Etherisc platform aims to stimulate new risk pools to meet this challenge. By creating templates for insurance products, it can give farmers, cooperatives, donors, buyers or even end-consumers the tools to create, at a far lower cost, their own customized insurance product. For the first time, risk-sharing processes can be placed in the hands of beneficiaries, supported by immutable smart contracts. In comparison to dealing with remote, traditional insurance companies, the customer experience could become direct, immediate and automated. Why is providing micro-insurance such an important priority? • They don’t understand the concept of insurance or the concept of paying a premium for something that may or may not happen. • They don’t have a bank account. • They may have some savings but usually, they can’t afford insurance. Having insurance for these people can mean living above or below the poverty line. I believe it because I have seen it and felt it. They are really caught in a vicious circle. You have almost 500 million small-scale farmers worldwide – that’s around 70 percent of the population of the EU and almost twice the population of the US – that produce food for around two billion people and do not have access to insurance. If you can find a solution, where these farmers can get access to insurance in case something happens, you can prevent them from falling into debt and help them restore the situation. This way they can also improve the quality and quantity of food produced. And if you take into account the growing population, increase in food production is something that has to happen. This is the thing I’ve mentioned before and something that I repeatedly discuss with multinationals. However, this was something that was not possible before the introduction of blockchain technology. That is something that we are working on. Isn’t this the kind of technology that large insurance companies would also be concerned about? Or, do you think that it will be a long time before they look at this? Of course, insurance companies are also looking at it. It is happening now. I have been trying to push this for the last 4 years now. The fact is that the DNA of an insurance company is to prevent risk and they consider the blockchain technology to be too new a technology – one that hasn’t proven itself yet. This is true to some degree. The often made comparison is the internet of the 90s. Back in the 90s, people were of the mindset that they wouldn’t need the internet; that they wouldn’t need email when they have a fax machine. Blockchain technology is also in its nascent stage. It is a very simple product. You need to be able to explain about how it works in simple words. It is something which is relatively easy to code into an erupting solution. We now have insurance products for flight delays. That also works according to the same principles. You use the data of companies that collect the data of departure and landing time of flights. So, if at some point your flight is delayed by 15 mins, then automatically the payment is being made. That is the type of products that are also now interesting for mainstream insurance companies and travel agencies. My personal focus is on inclusive insurance because that is something that I have been working on for a long time. That is where my expertise lies. So, how much of this is now actually available on the ground? I mean, are there any micro insurance solutions using blockchain that is actually being used now by farmers? Not directly. There are now a couple of proof of concepts going on. We expect to sell the first agricultural insurance product in March. That is what we are working on right now in Sri Lanka, with a local insurance company. We are working with AON, a large international insurance broker, we talk about mainstream parties. We are also working with SANASA, a local Sri Lankan insurance company and Oxfam. Based on their inputs, we are building our product. We will sell our first product in March. Your role as a company would be to develop this technology and then you would partner with insurance companies across the globe who would want to use your technology. Is that how it is? Do you directly get involved with insurance on the ground, do you? Yes, right now we do. But we are working in different ways. For example, we are currently working with a startup – an insurtech startup in Kenya who uses our platform. So, we actually want all organizations to use our platform. I am sure in Bangalore you have technology and software startups in plenty. We invite them to work with us, use our platform. It is open source. We have a model that offers local parties to work in an incubator environment. They can use our platform, or, if they have certain amount of expertise, they can do it themselves. We can help if they need our expertise. We can also help them source funds for executing this project. If you are publishing this article in Bangalore and if it can be shared with software developers, please go ahead. I think the expertise and the understanding of what is happening in this space matters at a local organization level than from top down. What do you see happening in India with respect to the blockchain technology led insurance products, considering that you were in India many years ago and this is where it started from? Yes. I am actually surprised that it takes a while before I see some real initiatives starting in India. There is coding on blockchain technology. Solidity – the programming language used to programme Smart Contracts and we see shortage of people who can do this. What I know is that, for example, MasterCard has hired a whole bunch of Indians to programme this language offering them high salary. I think this is something that will change in the next couple of years because it is a great opportunity for people who take the initiative to learn this coding language. I see many jumping into this. Right now I am not aware of a lot of initiatives in India – just 1 or 2 perhaps. What are the main hurdles behind this technology entering the mainstream? Proof of concept! I think many organizations are taking the wait-and-see approach. By doing that they are delaying the programme themselves. That is what I keep telling organizations to join us in this journey to learn how we can be successful. Not everybody takes that chance quickly. It will take time. We will have to demonstrate how it works in the coming months and show the cost reduction. That is how we can get more organizations to join the bandwagon.